Virtually every construction project generates debris that needs to be disposed of properly. From roof tear-offs to kitchen renovations and new home construction – if you’re a contractor or homeowner with a construction project coming up, our construction dumpster service has a construction dumpster to fit your needs. Open-top, roll-off containers provide the ability to remove large amounts of debris relatively easily. Since many contractors managing fairly large construction projects need to remove tons of waste material, they usually request larger dumpster sizes for their construction dumpster service, such as 30 cubic yard and 40 cubic yard roll-off containers. 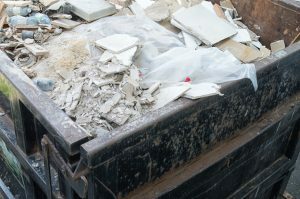 These larger dumpsters are often loaded with a variety of construction and demolition debris, such as drywall, plaster, glass, vinyl siding, and scrap lumber. But sometimes heavier waste material — such as asphalt, concrete, cinder block, brick, and dirt — requires smaller dumpsters for the safety of the trucks and the containers. Construction debris removal can be challenging, even for experienced contractors. State and federal regulations can require specific waste disposal techniques and processes that can make debris removal risky. Our construction dumpster service features experienced professionals who can help take the confusion out of construction waste removal. From small construction projects to large-scale commercial developments, our construction dumpster service specialists can advise you on proper type, size and placement of your dumpsters to help your job site stay cleaner, safer and more efficient.